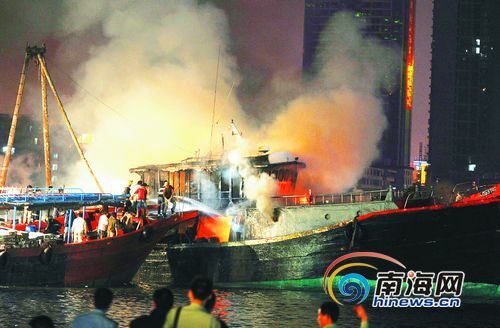 A Hong Kong-registered fishing boat burst into flames last Sunday evening in Sanya Port. Thanks to the immediate rescue by firefighters, no casualties was caused in the accident, reports 0898.net. All the crew members were having dinner when the boat caught fire at around 8:50 pm. Firefighters arrived at the spot within 5 minutes upon receiving the emergency call. The boat was still burning as intense flames and smoke sprouted from it. For fear of the fire spreading to nearby fishing boats, firefighters immediately evacuated the people on board and dragged other fishing boats to a safe place. The fire was finally put out half an hour later and no one was injured during the accident. However, the boat was totally damaged by the fire, with a direct loss of more than 2 million yuan.